We went diving last weekend! We did a beach dive on Saturday at Coquina Beach. The weather was fantastic and I got to dive twice that day. The water temp was about 72 degrees there. Sunday we dove with some friends on 1 mile reef. After the initial shock of the water temp, it was a great dive. It was 65 degrees with only a 3 mil. The vis was only about 10 feet, but we saw some huge sheepshead, snapper and my boyfriend speared a hogfish so I had a great dinner. Thanks to our friends Randi and Rene for letting inviting us and we love their new boat! After the dive we stopped at a little hole in the wall and enjoyed a hot dog and some frothy beverages. It was another fantastic day in Florida. i live not to far from there would love to go. i have been right off the beach in about 20 feet and got stone claws yum yum. 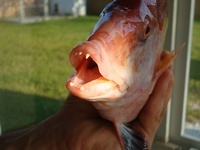 I love the teeth on that fish. Can`t wait for summer so we can dive every Sunday like last year with you guys. Your our best dive buddies ever! Anyone up for a Jersey beach dive/GW dive this weekend?